The plot feels appropriately standard-issue. Former black-ops sniper Sam Blake (Martin Kemp) is forced into a 6-hour murder spree by a masked terrorist after his daughter (the gloriously-monickered Dani Dyer) has been kidnapped. The terrorist has a similar hold over another young woman, Lexi (April Pearson), who seems equally as upset and daunted as Sam under this duress. Meanwhile, the police hunt Blake down as his kills catch public attention, with D.I. Hannah Siddiq (Anouska Mond) lumped with ignorant partners on the hunt for Blake. Add into this mix a sinewy, murky subplot of government official á la Nigel Farage organizing a Nationalist demonstration and this collection of plots becomes nothing but a tangled mess by the tiem the final act rolls around. If Age of Kill has a single triumph, it is that it somehow manages to raise more questions than it answers. The melange of plots brush up against each other for the majority of the film without ever managing to properly mix until it’s too late. The resulting plot holes are too big to ignore, while character development and exposition occur past the point of maintaining interest (if they ever come at all). The script has created such a generic and schlocky narrative in this vein of British crime drama that its hard to believe it got the green light at all. What drives these characters? What motivates this plot? The premise biols down to “murder these people or the one you love gets murdered”. It’s a thin story tactic to begin with unless done properly – think Taken (2008) – and here it’s given so little in the way of pathos. Why should we care if Sam Blake’s daughter gets murdered if we don’t know enough about either of them to care about them in the first place? Moreover, why should we invest in any one of these characters when we are left to subsist on meager scraps of personality tropes: geezer gunmen, inflammatory politicians, smart-but-undervalued women? This film is far too hackneyed an effort to ultimately be given anything more than a passing nod of recognition for its sleek design. There’s too much faulty wiring in this low-caliber actioner and any emotional payoff comes far too late. 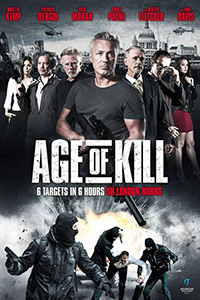 Age of Kill is ultimately another poorly-acted, poorly-constructed film that will only disappoint viewers who are hungry for a good action film.